October 29, 2013 Posted in DK Travel, Photo, The Americas.Tagged Discover More, DK Travel, San Francisco, USA. We sent Michael out with a DK Eyewitness Travel Guide: San Francisco to get his perspective on what it means to use a travel guide in his hometown. San Francisco strikes the perfect balance of city and nature. There’s a lot of diversity packed into this little 7 x 7 mile square. It’s very easy to visit a great beach, park, museum or restaurant. Everything is 10 minutes away. Can you sum up the people of San Francisco? The people of San Francisco are a great mix of transplants! They are very driven and health conscious, they love to cycle and hike all over the city and beyond. 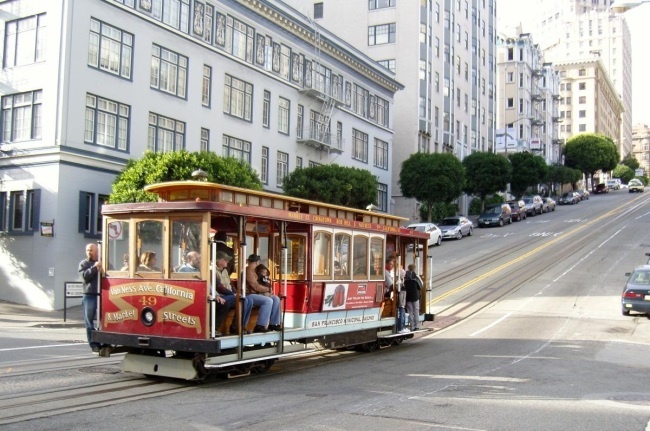 It’s culturally very diverse, from Chinatown to Japantown, North Beach to the Mission, we have it covered. The people here are friendly and laid back, and they will help you with directions! What was the experience like looking through a DK Eyewitness Travel Guidebook for your own local city? It was very interesting. I have been to most of the places in the Guide Book! I have spent the last 2 years being a tourist in my city, so finding something new was a challenge. Did you find anything inspiring about your city in the book? The five guided 90-minute walks are pretty awesome. I discovered Lincoln Park and the Japanese Tea Garden in Golden Gate Park. Tell us about the photos you shot for this project? I had the idea to overlay photos in the book with the actual locations. The tricky thing was finding the same vantage point. Some of the locations look a bit different from the book, trees have grown or things have been painted over, so it was like a scavenger hunt looking for these images! I wanted to show color and diversity in my city with the people, architecture, and landscape. I liked the idea of a hidden gem in the middle of the city; I love quiet places where you forget where you are. Describe a perfect day in San Francisco? Breakfast at Plow, renting a bike and riding through Golden Gate Park stopping at deYoung Museum and the Japanese Tea Garden. Heading down to Ocean Beach, visiting Sutro Baths and hiking Lands Ends trail to Mile Rock Beach, followed by dinner at Universal Cafe. I love where we are geographically; it’s so easy to escape the city. You can head up north to Marin, Mt. Tam and wine country. Or drive south to Pacifica, Half Moon Bay, and Moss Beach. It’s the ultimate day trip city. I wish the city had more creative energy; it’s very tech-centric. It’s the land of startups and apps. It would be nice if SF had a little bit more NYC in it! How beautiful it is and mild the weather can be, especially in the fall! Thanks for all the great SF insight Michael. Can’t wait to come visit! Rent a car and drive over the Golden Gate Bridge, take 2nd exit and head up to Marin Headlands. Drive along the coast with views of the bridge, then wind down to Rodeo Beach. Have lunch in Sausalito at Fish and visit Heath Ceramics. Perfect day!